The vases are the result of a collaboration between master ceramist Alessio Sarri and Analogia Project. The aim of these objects is to explore two opposite essential elements that make our existence: air and matter, power and fragility. Pure geometrical shapes of white refractory ceramic have been exploded when still fresh. The process of making them followed an experimental methodology. Afterwards, they have been left drying and then cooked, following a traditional ceramic process. The moment of explosion is therefore fixed in the matter. The result is a block of coloured ceramic exploded showing its intimate white texture. Ettore Sottsass defined ‘wrong ceramic’ some ceramic pieces that he did by using unconventional materials and processes. 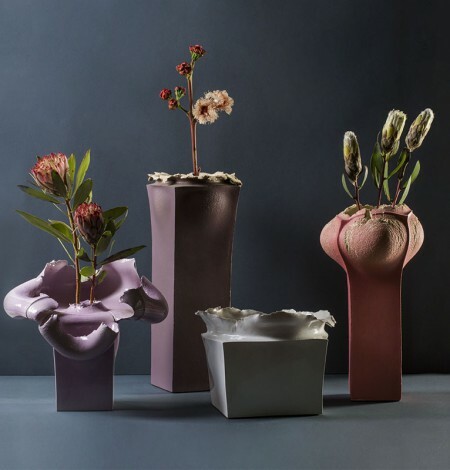 These vases could be also defined ‘ wrong ceramic’: contrary to the standard process, they have used very relevant thickness, they put together ceramic and porcelain, they have been coloured when still fresh. As Sarri explained, they have been making without thinking about the material’s limits but with an experimental approach, by trying, testing and establishing new cause and effect relationships. The result shows at the same time both the matter’s heaviness and fragility. The vases are produced by Alessio Sarri Ceramiche. Categories: Analogia Project, OBJECTS. Tag: Glass.